Lebron James is a hero in his home state of Ohio and supports every professional and college team in the state. Recently, he was a huge supporter of the Cleveland Indians, as they made their deep playoff run and earned a trip to the World Series. The Indians faced the Chicago Cubs in the World Series and it was one of the best World Series that major league baseball has ever seen. Each team played amazingly and it came down to an epic game 7, which was played in Cleveland, and the Cubs were able to win. At the game, was a very excited Lebron James, who was rooting for the Indians. Then, bring in Lebron James’ best friend and former teammate, Dwayne Wade, who is originally from Chicago. 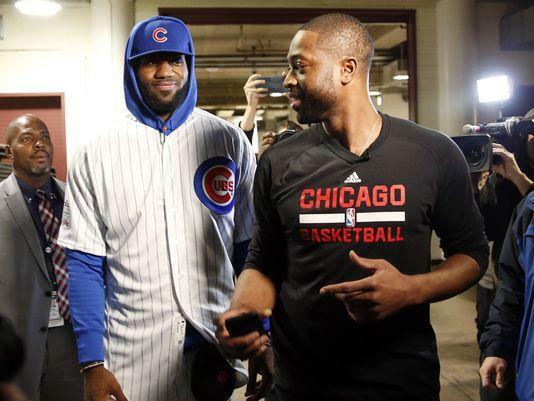 Wade supported the Cubs throughout the season and made a little friendly wager with his best friend Lebron. 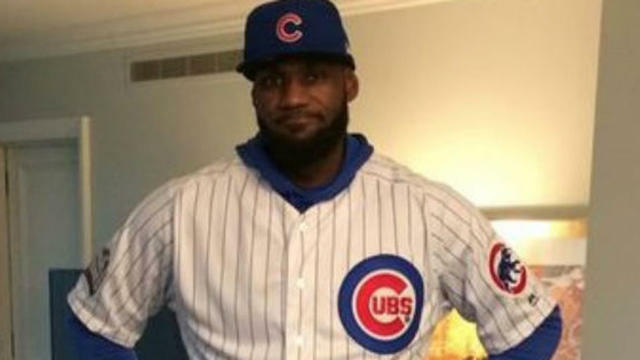 If the Indians won the World Series, Dwayne Wade would have to wear a full Indians uniform; and if the Cubs won, James would have to wear a full Cubs uniform; when their two NBA teams met each other during the first meeting of the regular season. Friday night the Bulls played the Cavs and Lebron James was in a full Cubs uniform before the game started. Wade took full advantage of his buddy dressed up in a Cubs uniform last Friday night. When James showed up at the Bulls arena for the game, his best friend, Dwayne Wade, was there to greet him, filming the whole scene on his phone. Wade was waiting and ready for James as he posted the whole moment on his Snapchat. James looked pretty good in a Cubs uniform, but also looked pretty embarrassed during his pregame encounter with his former teammate. Wade, on the other hand, was taking full advantage of the situation, and was poking and playing with James while he wore the Cubs uniform. Wade got both laughs in on Friday night, as his Bulls were able to defeat the Cavs in the game as well. It was really cool to see James man up and go through with his side of the bet. Sports are great for everyone to watch and be a part of, and when you get to see a different side of the sports stars, as we all got to see with this bet, it really brings a smile to your face. Hopefully, more sports stars will take notice of this friendly wager and will do some of their win in the near future. Either way, I don't see James and Wade making any NFL bets any time soon, as neither the Bears or the Browns will be making the playoffs anytime soon.